Gonyosoma boulengeri is also known as Rhinoceros ratsnake. It has a prominent, distinctive, scaled protrusion on the front of its snout, which has led to its common naming after a rhinoceros. Herpetologists don’t know the purpose the horn serves. 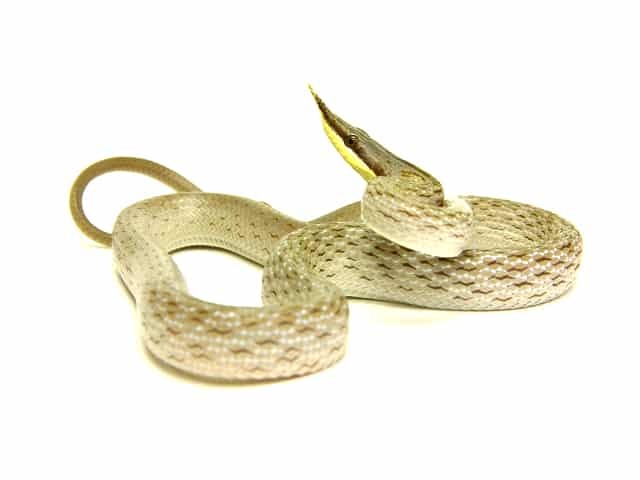 As a hatchling, Gonyosoma boulengeri has scales of a silver color; they turn green as the snake ages. I maintain these principally in rack systems. For adults, I utilize 28 quart tubs; for juveniles, I utilize Vision Hatchling tubs. I have also used 0.6 x 0.6 x 0.6 meters (2 x 2 x 2 feet) arboreal cages and larger for display. These are best housed individually, unless they are in large display setups where the animals can get far away from any cage mates while remaining in good microhabitats. Males, particularly during breeding season, will engage in combat behavior, and will aggressively pursue females, including copulatory bites. This species likes to sit on elevated perches in a flat coil, akin to Annulated Boas and Solomon Island Tree Boas, rather than a Green Tree Python or Emerald Tree Boa. Newborns are best kept individually in storage containers with lids – they can escape from small tolerances between the tub and the rack system. Neonates have been known to eat other neonates when kept in groups. I typically include cork bark flats and tubes to provide hiding places on both sides of the enclosure and increase the usable space in the enclosure. I principally utilize shredded Aspen for juveniles and adults, and paper towel for neonates. These are very hardy snakes that do well at most temperatures between 16-29 °C (60-85 °F). Especially as neonates, they are susceptible to overheating if exposed to continual temperatures above 29 °C (85 °F) without an opportunity to reach cooler temperatures. If ambient temperatures are below 24 °C (75 °F) continually, I will offer a basking spot that allows them to reach 29-32 °C (85-90 °F), either through the use of an undertank heat pad or elevated basking spot and low wattage light. I utilize an 8 ounce disposable water cup for water at all sizes. I do not mist them; this species is susceptible to skin problems when maintained too wet. Females in particular love to soak in the water bowl; I’m not sure why there is a gender discrepancy in the propensity to soak, but I have observed it in my collection over the last 15 years. For adults, I generally feed one weaned mouse per week, during the season where they are willing to feed: males typically fast after brumation through the time females ovulate, or even lay eggs (typically this is March through June/ July in my collection). As such, I typically feed males eight to twelve weaned mice a year. Females eat more consistently, and if they are re-productively active, I will feed them more frequently; they typically receive 16-24 weaned mice a year in my collection. Juveniles are fed an appropriately sized mouse once a week. Typically by the time of their ontogenic color change (8-18 months), they feed aggressively on frozen and thawed items offered on hemostats. Neonates can be hesitant to start feeding on rodents. Some have reported success leaving frozen and thawed pink mice in the enclosure, or floating in the water bowl. Additionally, many have reported success using alternative items, such as live fish or tadpoles in the water bowl. For reluctant feeders, I typically tease feed them with pink mouse heads offered while holding the snake in my other hand to limit a flight behavior response. Once established feeding, and often around the time of their ontogenic color change, this species can become food aggressive, often lunging out of the enclosure open-mouthed for food. For animals that display this behavior, it is useful to hook them out of the enclosure, at which point they will be completely tractable. Captive bred juvenile and adult specimens do not bite out of aggression; all bites I have received have been the result of a food mistake. Some neonates will bite defensively, particularly when restrained, but these are inconsequential. Wild caught specimens generally are much more willing to bite defensively than captive bred specimens, though it is still uncommon. On the rare occasion of a bite from this species, I have not observed any complications or effects, unlike Gonyosoma frenatum, oxycephalum, and jansenii, all of which seem to have some minor anti-coagulant properties in their saliva. This species does not tend to bite once in hand, and does not tend to bite the hand restraining it, unlike many of the Oreocryptophis porphyraceus ssp.. Using a particulate substrate, like shredded aspen or cypress mulch, these should be spot cleaned when waste is observed. If using a solid paper substrate like paper towels or newsprint, the whole sheet should be changed if waste is observed. The substrate should be kept dry for juveniles and adults, and may be kept lightly moistened for neonates. If your enclosure is particularly humid, be sure that the substrate is setup to drain the water away from the surface. These shed on a fairly regular basis: perhaps three or four times a year in adults, and up to five or six times a year as juveniles. They take a relatively long time to shed after going opaque compared to other species; they often take 10 to 14 days between initial cloudiness of the spectacle being observed to shedding. They should shed in a single piece without complication as long as they have access to drinking water during the period of opacity. This species has thick and durable scales compared to other colubrids; it is resistant to most damage, besides bites from conspecifics during breeding attempts (males of this species utilize a copulatory bite on females that can result in cuts, particularly if the female’s skin is weakened). These are generally problem free and hearty snakes. This species is susceptible to skin decay if kept too moist, or in a dirty environment. Additionally, this species tends to develop masses of dead cells between the muscle and skin if overfed; this appears to be an inability to process excess fats if domestic rodents are fed at too frequent a rate. These masses of fat and dead cells have appeared to cause, or develop into, fibrosarcoma tumors that can appear over the snake’s body. Sometimes this species will be offered for sale showing a dark stain in the center of each scale on portions of the snake’s body; this is usually a product of previously having had scale degeneration or subcutaneous masses in the affected area, and occasionally may be accompanied by a distortion or elongation of the scale structure.